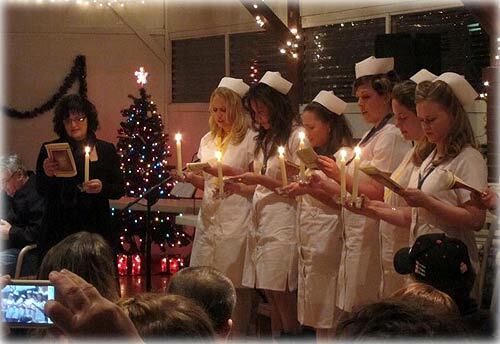 A formal pinning ceremony for Ketchikan graduates of the University of Alaska Anchorage Associate Degree Nursing Program was recently at the North Tongass Community Club. Seven registered nursing students received their pins. Fish Factor: Harvest management top budget item for fisheries By LAINE WELCH - Alaska’s commercial fisheries programs could get a slight boost if the Governor’s budget for the next fiscal year gets a nod from legislators. The proposed FY2013 operating budget for the Alaska Department of Fish and Game, including all state and federal funds, is just over $209 million, a 5.1 percent increase. For commercial fisheries, the department's most expensive unit, a budget of $70.5 million is a 4.4 percent increase. Governor Parnell also is proposing a bond package that includes $10 million to help Seward prepare to homeport large at-sea processing boats owned by communities in the Kuskokwim region. The vessels now are based in Seattle, and it could begin a transfer of other big boats to remain in Alaska year round. In the ADF&G budget, Commissioner Cora Campbell listed harvest management as a top budget item for fisheries. The report highlighted Yukon River salmon fisheries as a management priority due to its continued low productivity of Chinook. Another is managing Southcentral region Chinook salmon fisheries in the face of low numbers of returning adults. The state Board of Fish has designated seven king salmon “stocks of concern”, six in Northern Cook Inlet and one in Kodiak. The ADF&G budget report cites several fishery successes in the past year. Managers achieved a huge milestone in rebuilding Alaska snow crab stocks to sustainable levels within a federally mandated 10 year time frame, while still providing a viable harvest. Also mentioned: Alaska’s 2011 salmon harvest was the 3rd best since 1975; and the second best for groundfish in a decade. Click to the Fish and Game budget here. Fish and Game will lose 59 staff positions under Governor Parnell’s proposed budget. The commercial fisheries division will lose 13 full-time positions, and 46 part-time positions. Of the 288 vacant, permanent state government positions to be cut, most are in three agencies. Health and Social Services at 65; ADF&G at 59; and the Dept. of Transportation would lose 58 jobs. 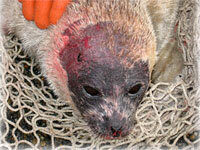 Alaska: DEATHS OF RINGED SEALS IN ALASKA DECLARED AN UNUSUAL MORTALITY EVENT; WALRUS PENDING;Cause not yet identified; public encouraged to report sightings of diseased or dead animals - NOAA has declared the recent deaths of ringed seals in the Arctic and Bering Strait regions of Alaska an unusual mortality event, triggering a focused, expert investigation into the cause. A decision by the U.S. Fish and Wildlife Service on making such a declaration for Pacific walrus in Alaska is pending. Since mid-July, more than 60 dead and 75 diseased seals, most of them ringed seals, have been reported in Alaska, with reports continuing to come in. During their fall survey, scientists with the U.S. Fish and Wildlife Service also identified diseased and dead walruses at the annual mass haul-out at Point Lay. Seals and walruses suffering from this disease have skin sores, usually on the hind flippers or face, and patchy hair loss. Some of the diseased mammals have exhibited labored breathing and appear lethargic. Scientists have not yet identified a single cause for this disease, though tests indicate a virus is not the cause. 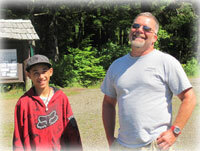 Ketchikan BBBS: Lashawn & Gregg Harrison by Susan M. Jaqua - Gregg Harrison, the owner the operator of Diversified Diving, is a rugged individual, a quintessential Alaskan and the Big Brother of Little Brother Lashawn. He, and LaShawn have been fast friends for 2 years, and bonded over enjoying the great outdoors, movies, and cooking too. "We go check out the girls as well", adds Gregg just to add balance to things. TOM PURCELL: Why We Need Better BS - Here's something we can do with less of in 2012: BS. It's all over television, in magazines and in newspapers -- and even in our serious papers, such as The New York Times. It is spouted by politicians and pitched by product spokesmen. Modern life is manufacturing an unprecedented amount of it. BS "is unavoidable whenever circumstances require someone to talk without knowing what he is talking about," writes Harry Frankfurt, philosopher emeritus at Princeton University, who authored "On Bull (expletive)." Thanks to cable television there are numerous opportunities for people to yap about all kinds of things they know nothing about. Nowadays, our news folks are almost as bad. It used to be that the press existed to catch folks in the act of BS-ing. But our press has been shoveling out a fair share of its own. Didn't the run-up to the last presidential election show that some of our "objective journalists" were in the tank for Obama all along?